Welcome to another busy week here! Jack is full swing into swim lessons. This is the first year that he is fully excited and can't wait for them everyday. So thankful for that. This week we are also helping my brother-in-law and his wife move into their first house. They live in a third floor walk up about 35 minutes away and now they will only be about 13 minutes away in their cape cod. Tuesday was the first big day of the move. A dent was made, but there is much more to go! Saturday will be a big day. We are happy for them and their pug, Franklin. 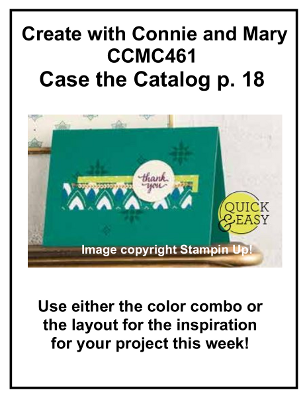 This week's challenge inspired me to pull out an "all in one" stamp set. By "all in one", I mean it's a set that contains words and the pictures to create a great card. In this case, Watercolor Words received the royal treatment and got inked up with some fun (and a couple new) colors! 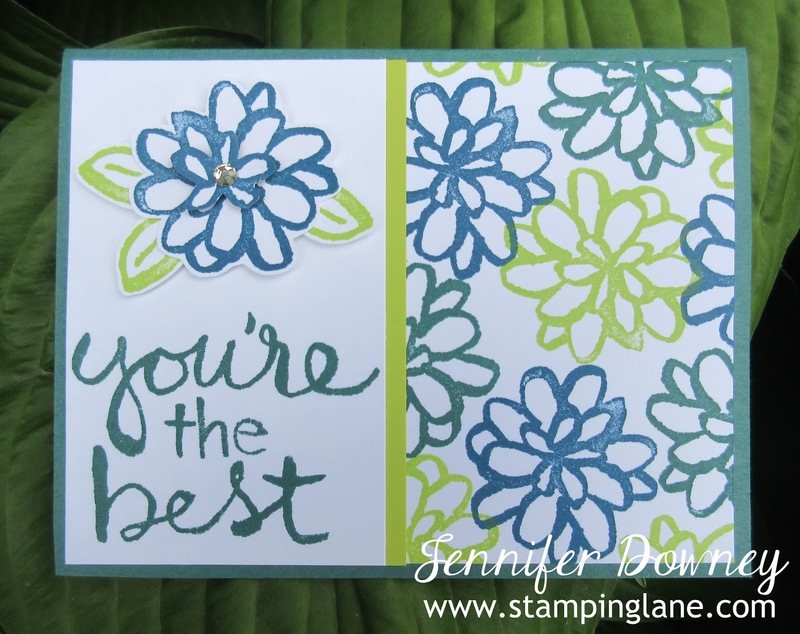 Dapper Denim, Tranquil Tide and Lemon Lime Twist make for a fun and whimsy floral card. Flowers come in all shape and colors right? 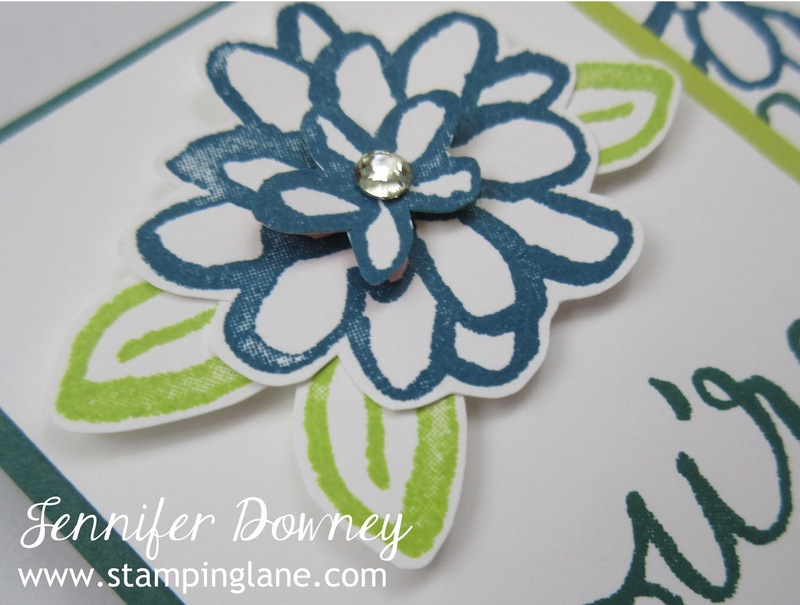 I did a little fussy cutting on the single flower and made it into three separate layers for visual interest. Each one is popped up on Dimensionals. I finished it off with a large Rhinestone in the center for a little sparkle. Thanks for stopping by! 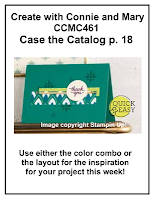 Check out all the other fabulous designers' creations with this challenge at Create with Connie and Mary. Happy Stamping! Love your stacked flower! 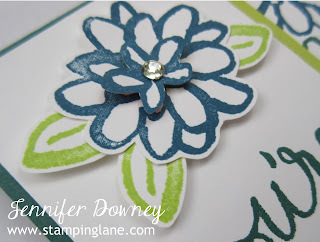 What a fun card for this color combo! Love the whimsy of your card! Those colors are great together. I love the "all-in-one" idea and card. Great way to use the color combination!